At present only about 7% of Singapore's fresh food is grown locally. This is an inevitable predicament for a city-sate with such a large population a limited land available. The importation of resources, in this case fresh food, has traditionally been the only option for Singaporeans. Modern technology has brought a solution along - vertical farming. Utilising vertical space to grow crops of produce isn't a new concept, though a commercially viable set-up has not been an option until more recently. 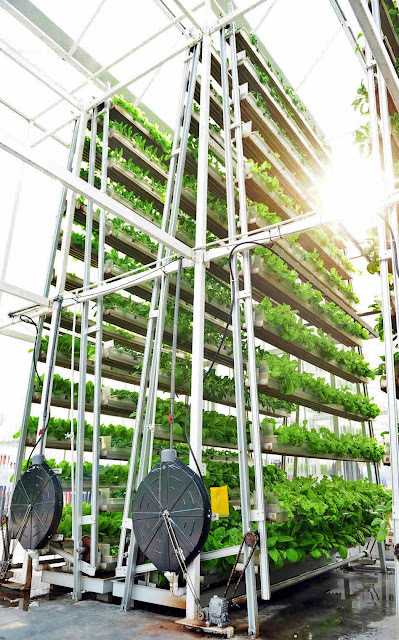 By no means will this new technology enable complete self-reliance in Singapore for fresh food, however it does offer a sustainable approach to growing food in densely populated cities. The Sky Greens vertical farm sits on 3.2 acres in the North West corner of the island. Currently 120 A-Go-Gro Vertical Hydroponic systems, 9 metres tall (3 storeys) are housed in large greenhouses. This protects them from the elements ensuring consist high yields of fresh leafy green all year around. Mr Ng's new technology looks a little like a Ferris-wheel of planter troughs rotating around an aluminium A-frame. 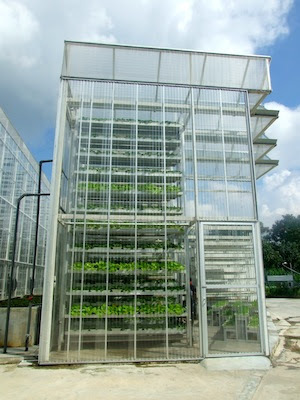 Each tower hold 26 troughs of 48 plants which are cultivated using hydroponic techniques. This process allows much higher yields than traditional farming, both in per unit area and in individual plants. Regulating water and nutrient levels ensures optimal growing conditions 24/7, resulting in a faction of the water and nutrient wastage usually experienced in commercial farming. 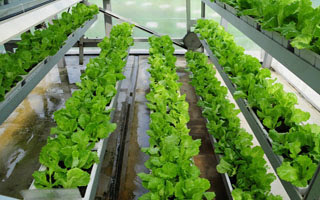 'As well as the economic benefits of continuous production and higher yields, Sky Greens say that the vertical farming system also offers many environmental benefits. The farm is seeking investors to help them expand from 120 towers to 300 - increasing daily supply for the current 0.5 tonnes to 2 tonnes! With the price tag of the first stage being at a stolid US$21 million, they do have their work cut out for them. However, people are enthusiastic about the new venture and the opportunity to buy locally produced food. A limiting factor for vertical farming is the access to light. With such a large amount of plants growing in one place many critics believe that the efficiencies gained by hydroponics techniques are lost when simply not enough light can reach the individual plants. Interestingly, after watching the video above, the rotating system for each of the aluminium towers is demonstrated becomes more clear. Hopefully by rotating the troughs up to the top of the tower all the plants get enough sunlight. Still, I think this is an excellent example of developing a solution a very common urban problem - space. I wish Mr Ng and his team all the best in expanding their farm in the future.